I’m relaxing in a pizzeria on Finisterre harbour having just returned from my eight kilometre stroll up to the lighthouse at the cape point. These past two days have been great. Anna (aka Barefoot), one of my original walking crew arrived in Santiago yesterday and we celebrated Spanish style. Cerveza and tapas (octopus stewed with garlic and mushrooms) until 2am. On my pilgrim schedule, 2am would almost be time to get up and start walking. This morning I took the three hour coastal bus to Finisterre and the views were breathtaking. I’ll be staying here tonight to soak up a bit more seafront ambiance and then head back to Santiago tomorrow afternoon. It’s been a perfect way to unwind after the Camino. As I sit on my balcony in Santiago, looking up at the cathedral towers, I find myself wondering what the Camino will mean in the long term. Will it be like hurricane Ivan; a defining event in time and psychological thought? Will I in the future refer to pre Camino and post Camino as I still do with Ivan? Is it the end of a period or the beginning of a period? Is it both? Or is it simply a minor waypoint in my life; easily and quickly forgotten? I will only know in time. But for right now it is very nice to be still. Inside the cathedral with the giant incense burner hanging from the rope. Walking the Camino de Santiago over the past twenty seven days has been an amazing experience. 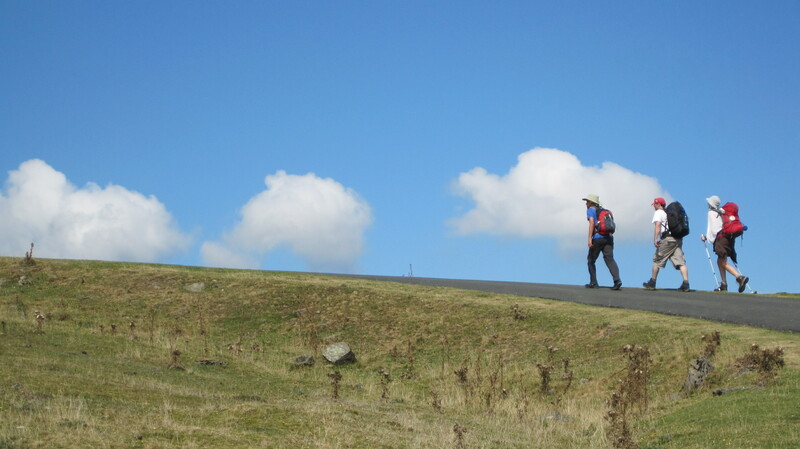 I’m sure each pilgrim’s camino is different but my camino had three distinct phases. The first phase – enjoyment – was filled with excitement and wonder. The beautiful landscapes and new food provided an exotic backdrop to meeting people from all over the world, hearing different languages and engaging in long, ambling conversations. Sleeping, showering and everything else in close proximity to tens of strangers was still a novelty and the caffeine, bread and chocolate for breakfast overcame the sleepless nights. The second phase – endurance – was tough. The lack of sleep finally hit me. The landscape was dry, dusty and hot. The trails were rocky and seemingly endless. It was time to be alone; no one wants to talk with a dry mouth. The afternoon heat was unbearable and swarms of flies buzzed my face all day as I walked. Then one day it all changed. Blustery winds, cold persistent rain, damp rooms – the endurance continued. The third and final phase – enlightenment – was really the last few days. The sun came out, the woodland landscape was quiet and beautiful, the walking was peaceful and reflective. I realised (or learned or remembered) some things in those last days. 1. I don’t need to worry. At no point did I have need for anything; everything was provided for me when I needed it. 2. I actually need very little to be comfortable; a clean, dry space to sleep, food and drink. But I do like my privacy. 3. Little things can feel like luxury – a warm shower, a hot coffee, a cold beer. 4. The pain of yesterday and today does not have to go with me tomorrow. A sore ankle can heal even as I walk twenty miles on it every day. 5. Other than God, my children are most important to me; nothing else even comes close.